POST a QUESTION or READ FAQs about the settings on the furnace blower fan limit switch and about the manual "fan on" or blower fan override switch. This article describes in detail the setting of furnace combination controls, also commonly called the "fan limit switch" on warm air heating systems. 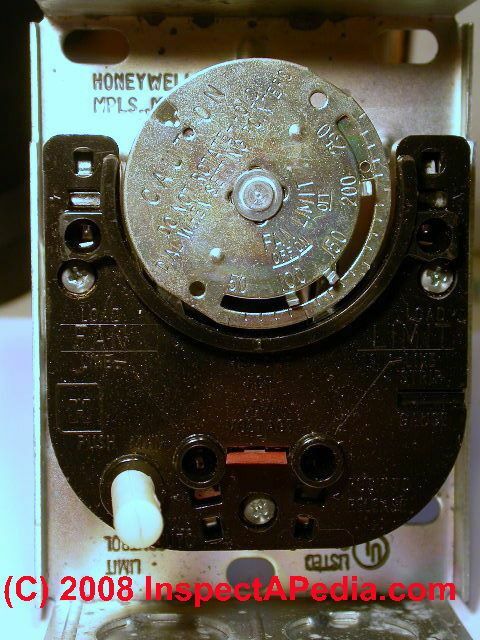 The photo at the top of this pag eincludes arrows pointing to the controls and wiring terminals in a Honeywell combination fan and limit control type L4064B. We provide a Guide to Fan Limit Switches on Warm Air Furnace Heating Systems: what is the fan limit switch, how to inspect and set its controls. Honeywell Combination Furnace Control type L4064 explained in detail. This article series answers most questions about central heating system troubleshooting, inspection, diagnosis, and repairs. We describe how to inspect, troubleshoot and repair heating and air conditioning systems to inform home owners, buyers, and home inspectors of common heating system defects. As we explained above, the furnace fan limit control turns the furnace blower on and off at the proper times. Below we detail the functions and normal settings for five controls found inside this device. 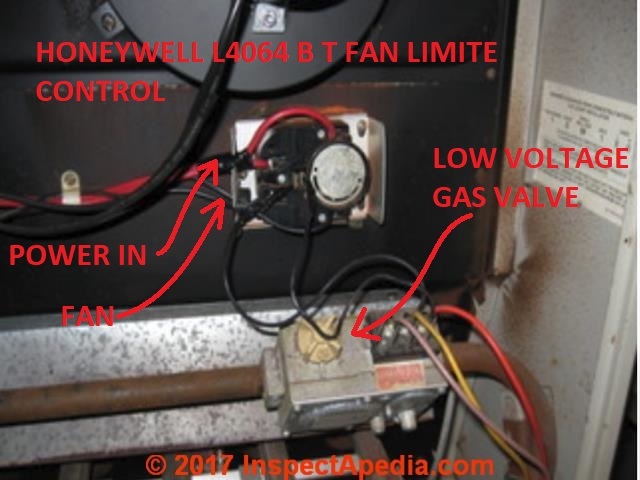 Image: a photo of a 1970's era Honeywell L4046T fan limit control installed on a gas furnace showing common wire connections on a gas furnace. A second pair of black wires is being used to control the furnace gas valve. Watch out: when adjusting the set points on the combination furnace control be sure to hold the round faceplate dial steady with one hand while moving the sliding fingers or pointers in its face. Otherwise you may bend, strain, or damage the temperature sensing element (the bimetallic spring and related parts). Bending the element could make the control fail to sense temperature accurately and thus could be dangerous. Also do not "turn" the silver dial by hand to try to make the control turn on or off. This too can damage the control, making it unsafe. at FURNACES, HEATING - home. This website discusses these systems and heating components in detail in articles listed at the end of each article. The furnace combination fan and limit control FAN OFF setting (blue arrow in our photo at left) lets the furnace blower continue to run for an interval after the furnace burner has turned off, but will shut the blower off after the heat exchanger has been cooled down and the heat it contained has been sent to the occupied space. The FAN OFF setting is the left-most metal finger protruding through the round silver plate of the fan limit control. Move the FAN OFF setting lever to the temperature at which the fan is to stop in order to prevent sending cool air into the occupied space. At the end of a furnace-on heating cycle, after the gas or oil burner shuts down, the furnace blower will continue to operate for a time. When an adequate warm temperature has been reached inside of the furnace warm air plenum chamber the FAN ON switch turns (green arrow in our photo at above left) on the furnace blower to deliver warm air to the occupied space. The FAN ON setting on this control makes sure that the blower fan does not turn on too soon (even though the building thermostat has asked for heat) so that the furnace will not blow cool air into the occupied space. This setting also prevents the blower fan from cycling on and off too frequently during a heating cycle. The FAN ON setting is the metal finger second from left-most, protruding through the round silver plate of the fan limit control. This finger is set to a temperature range from a minimum of 20 °F above the FAN OFF set point, to a maximum f 30 °F below the LIMIT OFF set point. From the factory the FAN ON is usually set to about 130 °F. The LIMIT OFF indicator setting (red arrow in our fan limit switch photo at above left) is a safety control that will turn off the oil or gas burner if temperatures inside the warm air plenum exceed a safe level. This is the highest temperature setting on a furnace combination control. It is set to the furnace warm air temperature at which this safety switch is to turn off the oil or gas (or other) burner or heat source. On the Honeywell L4064B the LIMIT OFF is set to a temperature between 100 °F and 250 °F. From the factory this setting out of the box is 200 °F. If the temperature inside the supply plenum reaches the "high" limit set at the LIMIT OFF finger, the switch will turn off the oil or gas burner. This condition may not ever happen under normal conditions with most hot air furnace systems - on those systems the burner continues to run all of the time the thermostat is asking for heat. Watch out: The LIMIT OFF or "HIGH" or "MAX" on the furnace fan limit switch is a safety device. The LIMIT STOP control is an extra safety device to make it difficult for an amateur to set the LIMIT OFF to an unsafe or too-high temperature. This control setting could be changed by inserting a pen tip or similar object into the round hole visible in the LIMIT STOP plate near the right end of the temperature dial and slog on the silver plate of the fan limit control. The LIMIT STOP is set at the factory to 200 °F. You should not change this setting as to do so maybe dangerous. 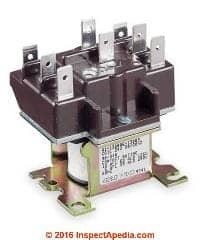 Fan override switch, also called a "manual fan switch" or "fan on switch" if present, is usually a white button that can be set to cause the furnace blower fan to run continuously or to run automatically driven by the temperatures sensed by the combination fan and limit control switch. 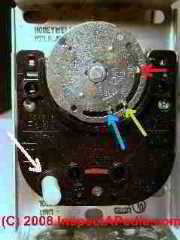 The fan override switch is indicated by the white arrow in our photograph. Manual-On furnace fan: Push the white fan override button "IN" to set the fan to its MANUAL position to force the furnace blower to run continuously. This setting can be used to move (and presumably to filter) building air through the heating duct system at any time of year. Automatic furnace fan: Pull the white fan button "OUT" to the AUTO to cause the fan to cycle on and off automatically in response to temperatures sensed by and set on the fan limit control dial. After completing these control settings be sure you test the combination fan and limit switch for safe and proper operation. 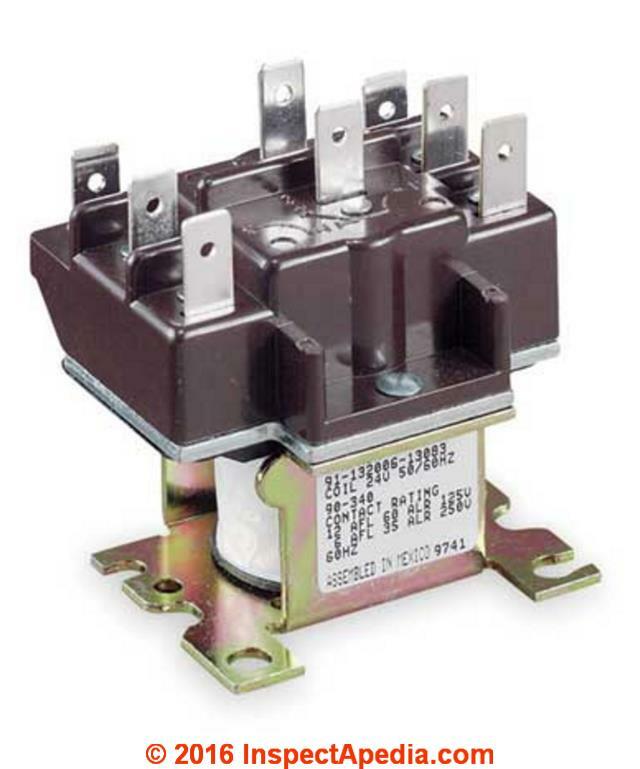 See FAN LIMIT SWITCH TROUBLESHOOTING for details. There we discuss troubleshooting furnace blower fan operating problems such as a blower that runs continuously or one that turns on and off to frequently. Rob, thanks for the suggesitons; I have revised, corrected and also clarified the article above, adding photos, and tuning up the text. We welcome critique, corrections, or suggestions from our readers. PUSH the white button IN to force the fan to ON or MANUAL or always-running mode. I have older electric furnace with heat and ac. I replaced the sequencers last year and the fan isolation relay last week. the wiring was suspect before the repairs, I had to rewire the 24 volt wiring. The only wire now I am wondering about is the 240v wire from the heat sequencer to the isolation relay. The only problem I have is: only the high speed fan runs. the low speed fan does not run when heat is on, it continues to run the high speed fan. this is is fan auto and fan on. What is the proper wiring from sequencer to fan isolation relay to have low speed fan for heat? I have high speed for ac and fan on as wired. For space we've moved this to a separate page. Honeywell Corporation, Minneapolis, MN 55408. Honeywell has sales offices in all principal cities in the world and has manufacturing facilities in Australia, Canada, Finland, France, Germany, Japan, Mexico, Netherlands, Spain, Taiwan, United Kingdom, U.S.A. Honeywell Form Number 60-0450 7-75, residential division. Continue reading at FAN LIMIT SWITCH TROUBLESHOOTING or select a topic from closely-related articles below, or see our complete INDEX to RELATED ARTICLES below. FAN LIMIT CONTROL SETTINGS at InspectApedia.com - online encyclopedia of building & environmental inspection, testing, diagnosis, repair, & problem prevention advice.